Dies R Us: Leaves Shower for Mom!! Welcome everyone to another inspiration post for DiesUs. Patricia here to create this adorable Mother's Day card. I just need to say that it is an amazing card for an amazing person! I am in love with this Weeping Willow Branches die from Poppystamps, I know that I will use this one a lot. I cut twice using green cardstock, and add it to the distress layer of the card one on top and one at bottom diagonally. Using Woodland Oval die also from Poppystamps, I die cut a piece of kraft cardstock for the sentiment on the center. Did you notice that the Willow branches cover mostly all the front of the card? 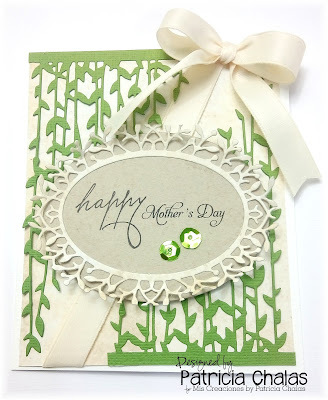 I then added and Ivory ribbon across the center of the card with a bow on top, the sentiment was stamped using Memento Black Ink and add it 2 green sequin to the center. I have to say that I love the outcome of the card is so delicate and simply... and it is just perfect for the occasion!! This is a beautiful card. The receiver will be very happy. Wonderful creation, Patty! Your mom will love it. Those really are fabulous dies....beautiful card! She'll love it! I don't know if I would have thought to put the will branch upside down, so creative! Love the green and kraft together and how you paired both dies with similar looks. What a stunning design for a fabulous mom! I too, love that you used the willow die in both directions. So artsy and clever!! Gorgeous card, such a clever idea using the willow die. I love he colour combination you have chosen.